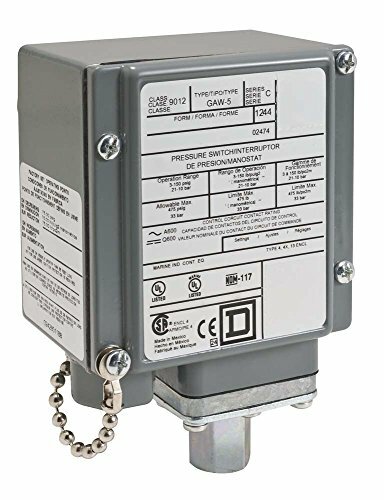 This Square D 9012GAW5 single-stage diaphragm-actuated pressure switch for machine-tool applications has a 3-150 psi range on decreasing pressure and 6.0-30.0 psi adjustable differential for control circuit applications in pneumatic and hydraulic systems. The NEMA 4, 4X, and 13 enclosure has a zinc-plated steel diaphragm housing. The switch is Underwriters Laboratories (UL) Listed and Canadian Standards Organization (CSA) certified. It has a 1/4"-18 NPTF pressure connection. Square D pressure switches are manufactured by Schneider Electric.